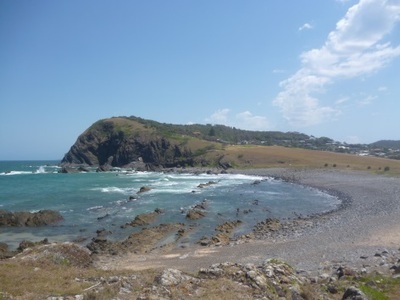 Crescent Head has long been a popular destination for many families, as well as surfers. 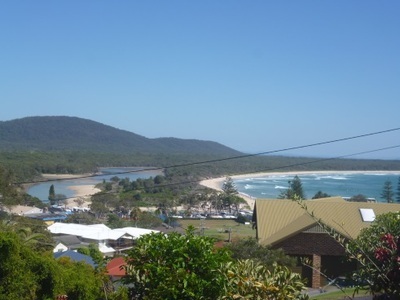 This coastal town is located about 440 kilometres north of Sydney, just east of Kempsey. A trip here is all about the beach and it is Main Beach that draws the biggest crowds. 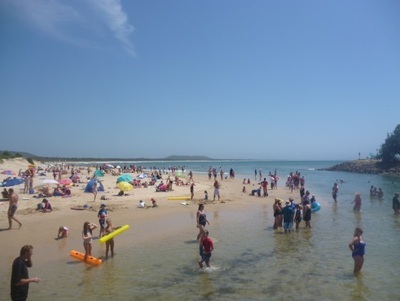 In fact, the place can resemble a Sydney beach on sunny days when families fill the sand during the school holidays. Looking up Main Beach from the bridge - the end nearest town gets pretty busy! It's easy to understand the reason so many head here. Main Beach offers all the traditional summer fun; including surfing, boogie-boarding, swimming, sandcastles and people watching (on one occasion there was a man wandering around with a branch on his shoulder, which turned out to have a large bird hidden in its leaves). 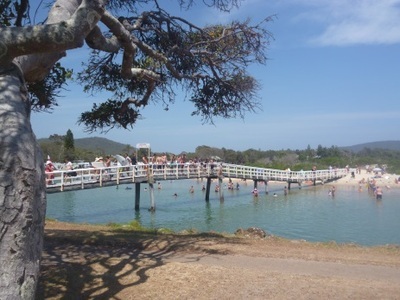 As well as all these familiar activities, Crescent Head offers a few extras, courtesy of Killick Creek, which runs along the edge of the caravan park and separates the town and the beach. 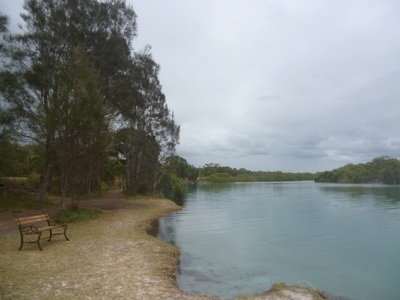 Its calmer, shallower waters are great for swimming and are also like a pool at times. Best of all, when the tide goes out, you can hop on your choice of raft and float out the river's mouth (don't worry, the current doesn't take you out to sea). With the water low, Killick Creek is also a convenient place to stock up on yabbies (if you don't mind being swarmed by seagulls). However, my family ended up doing our fishing at Korogoro Creek at Hat Head. We've had success there previously, but on this particular trip the water was so clear the fish could see us and kept away. It was still pretty beautiful though, and one of the few times we left town. If you can rip yourself away from the water, there are also other attractions within Crescent Head itself. 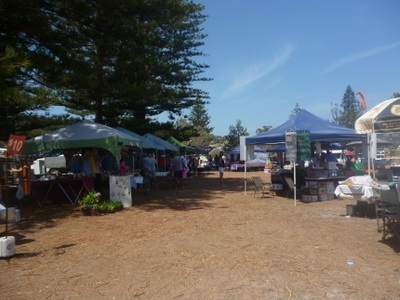 Markets are held at Crescent Head Reserve (within the caravan park) on the third Sunday of every month and additional dates during the holidays. 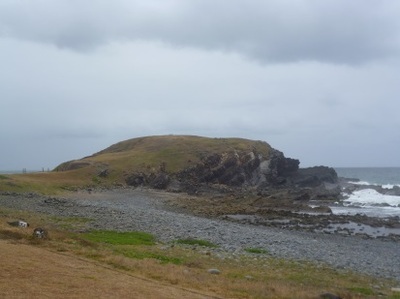 There's also the rocky headlands of Little Nobby and Big Nobby, which straddle Pebbly Beach. My favourite was Little Nobby, which can be incorporated into a walk from Main Beach for some good views (but a lot of wind). Big Nobby is much taller and has its own lookout at the top, but I found the view was largely obscured by trees. If you want to visit though, you can reach it via a track from the top of Crescent Head golf course or by car along Skyline Crescent. If you want to eat out around here, I found Crescent Head Country Cub to offer basic but generous meals. Or if whipping up something yourself is more your style, one unique picnic spot to take a look at is the Centennial Pavilion. It doesn't offer a beach-side setting, but the structure features a roof that used to be the cover of a steel reservoir in East Kempsey. Accommodation options in the town are varied. My family stayed at a rental property on one of the highest roads, with views over the entire area. 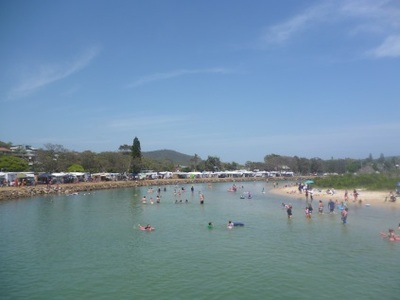 However many families choose to stay at Crescent Head Caravan Park, which really puts you at the centre of everything. But wherever you stay, you'll still have a whole lot to do right on your doorstep and will easily fill a week here.